In addition to the Classic Examples, review of case histories often assists in consolidating analysis rules for structural interpretation of dipmeters. A number of case histories have been gleaned from the literature and the author's files to illustrate some real life examples. Because of the inordinate detail available on many logs, most of these examples have been hand drafted by the original authors for clarity. An angular unconformity is the easiest feature to see in a dipmeter analysis. Pick regional dips in shale zones and draw in green patterns for each. The level where two different green patterns meet is an unconformity. Either dip angle, dip direction, or both will change at an unconformity. Check other log curves for lithology. If a sand separates two different green patterns, the unconformity could be at the top or the bottom of the sand. Usually the formation age will help determine which to choose. 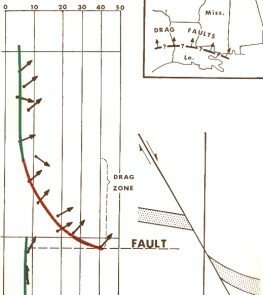 This is an example of a South Louisiana fault exhibiting rollover on the downthrown side. As the fault is approached from the downthrown side, the dip starts to increase. This increase continues until a maximum dip of 25 degrees is reached. Experience has shown that this maximum dip is recorded within 10 feet of the fault plane on the downthrown side. In this example, the direction of the maximum dip is ESE. Since the direction of the maximum dip is toward the upthrown block, and is perpendicular to the strike of the fault, this fault is upthrown to the ESE and strikes NNE-SSW. A small amount of drag is noted in the upthrown block, but it is minor compared to the downthrown rollover zone. 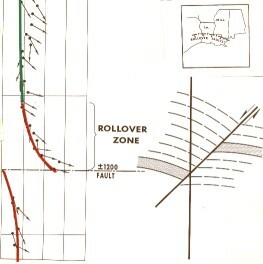 This is another South Louisiana example with rollover present on the downthrown side of the fault. However, in this case the fault and steeply dipping beds are dipping in the same direction. So, instead of the rollover zone dips adding to the structural dip, they actually cancel the strong northwesterly structural dips. Instead of the familiar maximum dip near the fault plane, a minimum amount of dip is now noted. As soon as the upthrown block is penetrated, structural dip is immediately recorded. This type of fault is sometimes found near piercement salt domes. If regional dip above the fault is subtracted, the apparent blue pattern (decreasing dip with depth) turns into a red pattern. Rollover causes a reversal of dip direction if upper beds are made horizontal by dip removal. 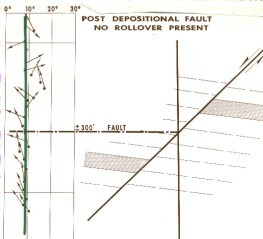 Some post-depositional faults may not be located by the dipmeter. No distortion is present near the fault plane, so structural dip is recorded by the dipmeter right across the fault plane. In high resolution or stratigraphic arrow plots a short zone of random dip may occur, but may be interpreted as a function of sand body deposition. Here is a normal fault from Mississippi which has drag instead of rollover on the downthrown side. 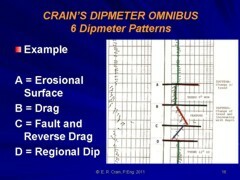 The pattern of dips is the same as that found near faults with rollover, but the direction of the highest dip is toward the downthrown block. 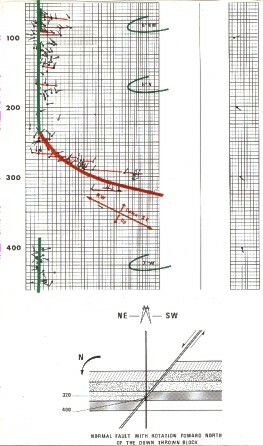 In this example, the direction of the maximum dip (41 degrees) is NE, so the fault is downthrown to the NE and strikes NW-SE. This example shows a thrust fault. Again we see a dip pattern similar to that found around a normal fault. The maximum distortion around a thrust fault is in the overthrust block, and the direction of the highest dip is in the direction of overthrust. Since the maximum dip shown in this example is 35 degrees East, this fault is overthrust to the East and strikes N-S. Some drag is noted in the downthrown block, but it is not as strong as that recorded in the overthrust block. Structural dip is indicated by the green pattern. Below 400, it is down to the west at about 7 degrees magnitude. Near 100, its magnitude is at about 6 degrees, the direction being more northwesterly. Between 225 and 325 is a strong red pattern of northeast dips. No dips could be computed between 325 and 400. This red pattern is probably the result of drag in the downthrown block along a northeast dipping normal fault. The fault plane strikes northwest-southeast. Some rotation of the downthrown block at the time of movement is evidenced in the more northerly trend of the structural dip around 100. In Well X, the long correlation interval (12') shows clearly the structural dip. It increases from near zero at 1,200 feet to 7 degrees at 4,600 feet, always in a southeasterly direction. 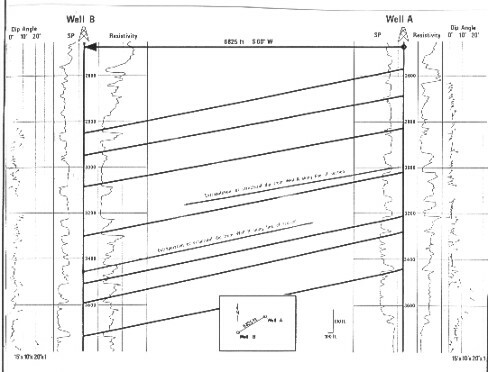 In Well Y, which is east of Well X, the long correlation interval plot also shows the structural dip clearly, indicating 3 degrees east-southeast at 1,100 feet increasing to 16 degrees east-southeast at 4,000 feet. One conclusion that could be drawn is that structural dip in this area is southeasterly, and that a given horizon in Well Y will be structurally lower than the same zone in Well X. However, the main sand bodies in Well X occur below 3,100 feet whereas the corresponding sands in Well Y are below 2,800 feet. Between 1,800 and 2,300 feet in Well Y, a reversal of dip direction is evident, increasing to a high angle to the northwest at 2,300 feet. This is a strong red pattern. It is followed by a blue pattern of short duration. 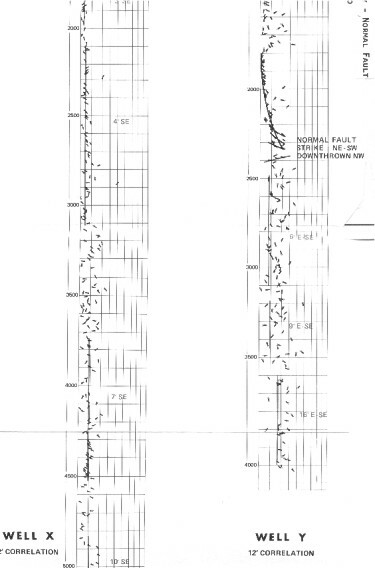 This characterizes a normal fault striking NE-SW, downthrown to the northwest, crossing the borehole at 2,300 feet. The presence of this fault explains the apparent inconsistency between the structural dip interpretation and the correlation between Wells X and Y. 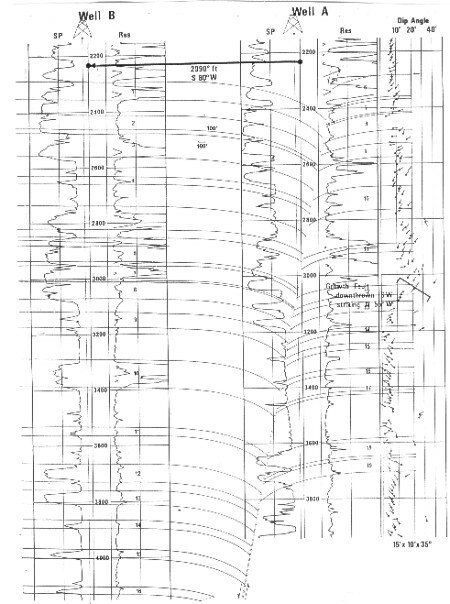 This example shows data from several dipmeters through a carbonate/shale sequence, controlled by seismic mapping. 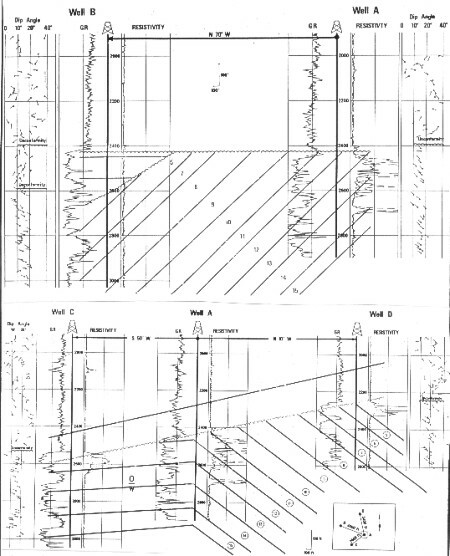 The complex overthrusts seen on seismic are confirmed by correlation of lithology based on open hole log analysis, sample description, and palynology. 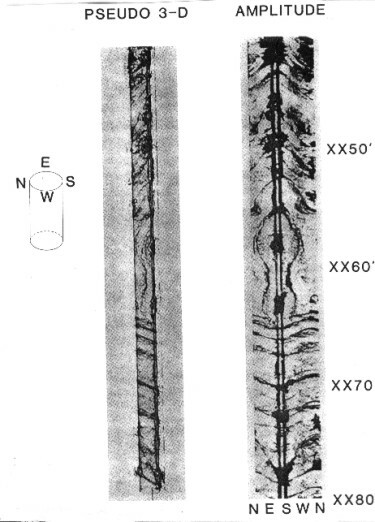 Hash marks on the well tracks show key dips only and indicate major bedding attitude. 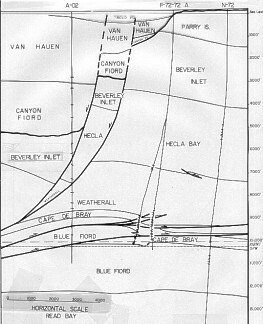 Whipstock and offset decisions were influenced by dipmeter data as the prospect was chased westward, with much help from seismic and imaginative structural geology. In thick sand shale sequences, there may be little evidence from curve shapes to aid zone to zone correlation. Regional dip superimposed on well cross sections will assist. Individual sand units may not be continuous across the section, but the correlation lines give clues to possible time stratigraphic sequences. Dip angle and direction data show two unconformities in Well B and only one in Well A. The major unconformity is nearly horizontal in Section A-B, but dips 3 degrees SSW on Section C-A-D. 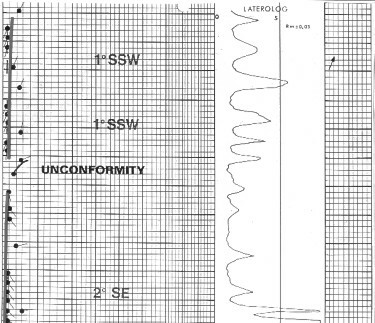 The angular unconformity controls trapping in all three wells, with a common oil-water contact in Wells A and C, and a higher one in Well D. Regional dip again helps to correlate possibly continuous sand bodies. A growth fault crosses Well A at 3040 feet, down thrown to SW and striking N 55 W. Evidence is strongest from the change in direction of dips at that depth. Correlation of numbered sands is from multi-well mapping and not solely from the data in this illustration. 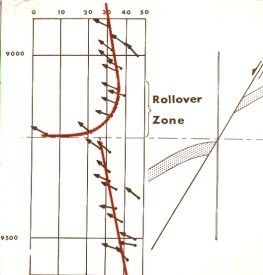 This illustration shows a microscanner image through what is claimed to be an overturned anticline. However, the dimensions are very small and the fold very, very tight, so it is possible that the shape is merely wedge shaped bedding tilted on edge or an angular unconformity. 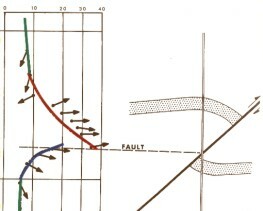 Since a fault plane is not visible, a fault interpretation cannot be supported.